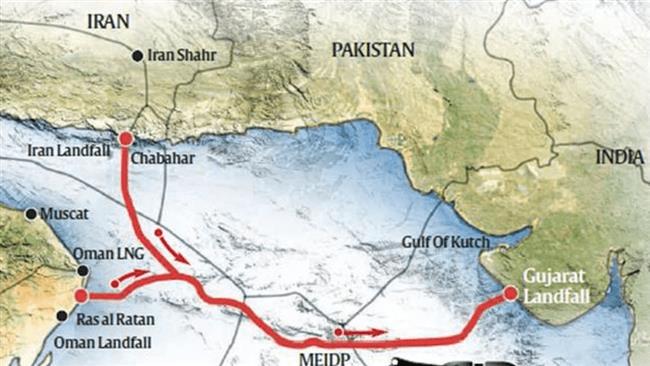 India-Iran Deal for Chabahar – New Kingmaker for Indian Ocean Trade? This week India & Iran signed the deal for India to develop the port of “Chaabahaar” in the Baluchestan province of Iran. The two countries have been discussing this project for over a dozen years. Now thanks to a determined, smart, committed, & far sighted Indian Prime Minister and Iran’s need for a major breakthrough in its oceanic trade, the two countries signed this historic deal during PM Modi’s visit to Iran this week. Many deals are called historic but much of that is hype. Chabahar could be an exception. The historical aspect is less important than the far reaching geo-strategic & geo-economic potential of this deal. Below we take you thru a quick yet broad rationale why, because of this deal, Asian Warrior called Chabahar port the New Kingmaker for Indian Ocean Trade. Access to the Indian Ocean has been a dream for Central Asia, Russia & China. Last year China committed $46 billion to secure road & potential rail access through that terror-infected regime called NonPakistan & its occupied portion of Indian Kashmir. That deal allows China to develop & manage the NonPakistani port of Gwadar located near the border of Iran. If successful, Gwadar would pose a commercial risk to Iran’s oceanic trade and a big threat to India’s naval, military & trade goals in the Arabian sea. Hence the obvious interest in development of Chabahar located a mere 75 km west of Gwadar & just on the other side of Iran-NonPak line of control. China isn’t putting up $46 billion to grant free access to the rest of Central Asia to trade through Gwadar. And NonPakistan’s reality as a terror-infected regime is widely known. So if you were Turkmenistan, Tajikistan, Uzbekistan et al, would you rather trade through the red route below through Gwadar or through the black, blue & yellow routes below through Chabahar? The simple map above shows why Japan is interested in providing financing for India’s investment in Chah Bahar port. It is in the interests of Japan to prevent China from dominating energy routes from that coastline. A China that has to compete hard for Arabian sea is a China that would be less inclined to shut off access via South China Sea. Despite concerns about sanctions on Iran, America broadly supports India’s deal for Chah Bahar because it prevents China from dominating that portion of the Arabia Sea. Already, the area around Gwadar & the entire NonPakistani portion of Baluchestan is engaged in a battle for separation from NonPakistan. The Baluch tribesmen have threatened to attack both the port of Gwadar and the oil pipelines from Gwadar into main regions of NonPakistan. All this makes Chah Bahar a much more attractive proposition. Iran may have a large coastline facing the Persian gulf but it’s only real port is Bandar-Abbas located close to its border with Iraq. And Bandar-Abbas is also the main port used by the Iranian Navy thereby limiting its use as a trade port. Besides Bandar Abbas already handles 85% of Iran’s seaborne trade and can be easily blockaded by the US navy that continuously patrols the Straits of Hormuz at the entrance of the Persian Gulf. Furthermore, Bandar Abbas can ONLY handle 100,000 ton cargo ships and most shipping today is conducted via 250,000 ton cargo vessels. Today, these ships offload cargo in United Arab Emirates and then forward cargo via smaller ships that can dock in Iran. Iran has to pay a huge cost for this. This also makes Iran vulnerable to a UAE closure of its seaborne trade in case of a conflict between Iran & Saudi Arabia- GCC. Chah Bahar is located 300 km east of the Straits of Hormuz & is the only Iranian port with direct access to the Persian Gulf, Oman Sea and the Indian Ocean. India needs Chabahar for three critical reasons. India is already becoming the biggest importer of oil from the Middle East. And India is already the fastest growing economy in the world. Today India imports gas only from Oman. The Chabahar port opens up the opportunity to import Iranian gas directly from Iran. What may not be obvious is that Chabahar port is only 550 km from the ports in Gujarat, India. In contrast, the distance between Delhi, India’s capital, & Mumbai, India’s commercial & media capital, is 1,400 km. This enables building an undersea pipeline from Chah Bahar that connects to the undersea Oman-India pipeline being built by South Asia Gas Enterprises Pvt Ltd (SAGE) . This would be the cheapest & simplest way for Iran to export gas to India. Afghanistan has always been India’s land route to Central Asia. But seizure of the northern part of Kashmir by NonPakistan in 1948 and the decision by Nehru to not recapture it have enabled NonPakistan to cut off all land access between Afghanistan & India. This is not only a trade issue but an important strategic problem. 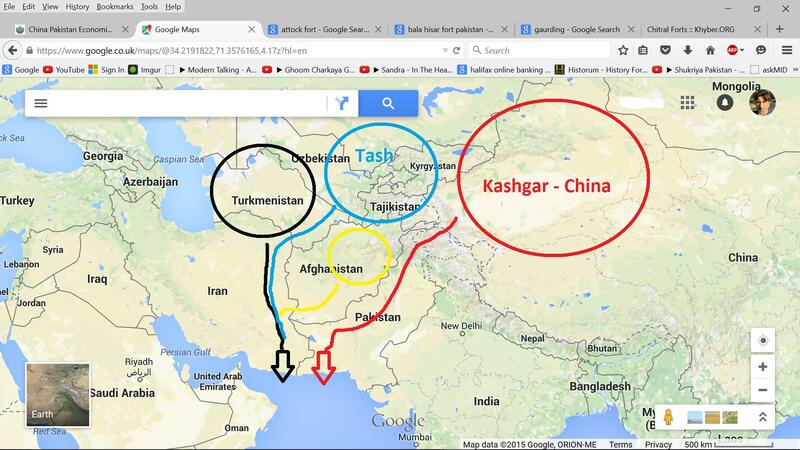 Chabahar provides India a direct land route to western Afghanistan as the simple map below shows. India is also building the road between Chabahar and the Iranian city of Zahedan. 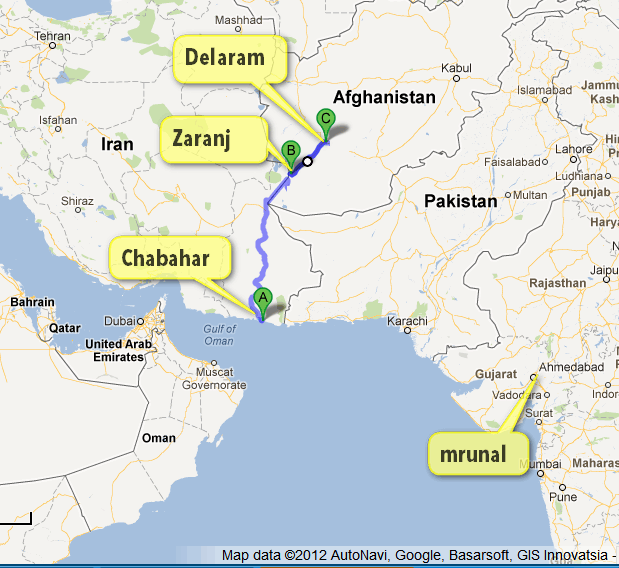 That would connect to the road India has already built between Zahedan & Delaram via Zaranj. And Delaram is located on the ring road that connects the 4 major cities of Afghanistan – Herat, Kandahar, Kabul & Mazar-e-Sharif (see the map in section 3.3 below). That delivers road connectivity between all of Afghanistan & Chabahar for Indian goods into Afghanistan & Afghani goods into India completely bypassing NonPakistan. Afghanistan is merely the most obvious & initial step. The bigger potential of Chah Bahar is as an outlet for Indian trade with Europe, Russia and Central Asia via the ambitious North- South Transit Corridor (INSTC) initiative. Compared to the current Indian Ocean-European transport route via the Red Sea, Suez Canal and the Mediterranean, the Chah Bahar-based INSTC is estimated to be 40% shorter and will reduce the cost of Indian trade by 30%. 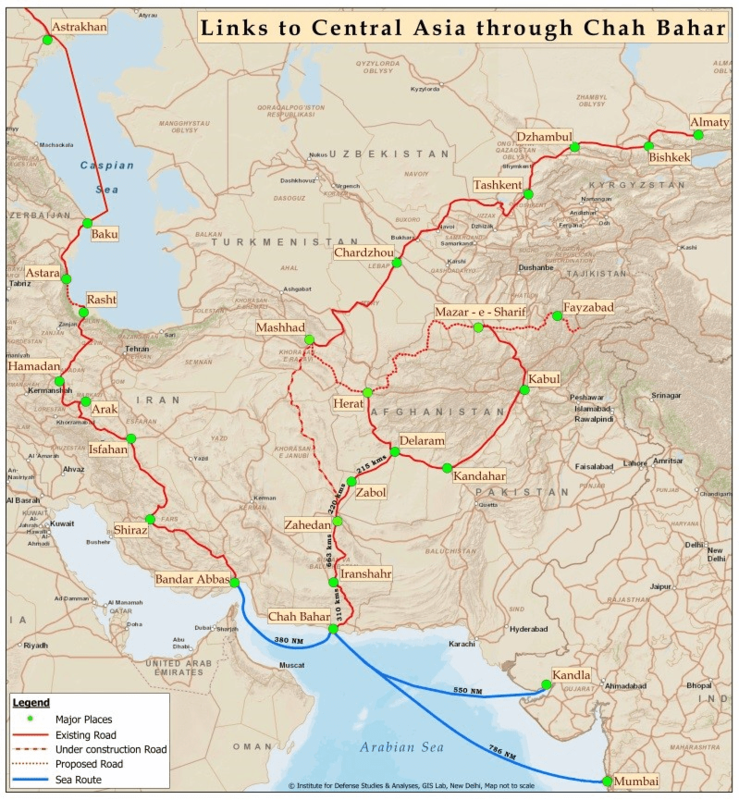 The planned road on the right from Zahedan to Mashhad would connect Chah Bahar to all of Central Asia and completely bypass NonPakistan. The end result would be that NonPakistan would remain a Chinese vassal that only serves as road access for China into Persian Gulf via Gwadar. Notice Afghanistan easily connects to this Chah Bahar originating Central Asian road either from Herat to Mashhad or from Delaram to Zahedan to Mashhad. Thus Afghanistan would no longer be dependent on NonPakistan for road access to the Arabian Sea. What about the road on the left of the above map? It connects Chah Bahar to Baku, Astrakhan and to St. Petersburg in Russia. From there to Finland & Scandinavia. The enormity of this potential is why this India-Iran deal could make Chah Bahar the new kingmaker of Indian Ocean trade. Did you notice Baku in Azerbaijan on the map above? Baku, according to Stratfor, was a reason for Hitler to invade Russia in WWII. What is a simple way to understand the importance of Baku? Baku represents the big red dot in the map below. Russia is the dominant player in these Central Asian regimes from Azerbaijan in the west to Kyrgystan in the east. China is now emerging as another major player. How do you think America likes that? That is why even America, an America tired of building peace in Afghanistan & an America now resigned to leaving Afghanistan to China-NonPakistan, will find it easy to like the India-Iran deal to lessen the control of Russia & China in Central Asia. 5. What about GCC, Saudi Arabia & Israel? The enmity between the Sunni countries of the Gulf & Iran is real & bitter. But no one in the Middle East can afford to ignore India, an India that is rapidly becoming the biggest buyer of energy from them. UAE is already building a strategic energy & military relationship with India. They plan to use India’s petroleum reserve storage facilities as strategic & geographically diversified storage for a portion of their own strategic reserve. India is already in talks to export military equipment to UAE. Saudi Arabia has begun discussions for a larger relationship with India. The relationship between India & Israel in getting more & more strategic as two non-Muslim countries located at the two ends of the Islamic Crescent. Israel is already a major partner of India in military & other trade arenas. India is already large enough to be friends with all these warring parties and they know India within 10 years will be a must partner for all of them. They all know that India has no interests in any territory from any of them and is not a military threat to any of them. And an Iran engaged in energy & trade with India is a safer Iran for all of them. As long as Iran doesn’t go nuclear. India does not want a nuclear Iran that could become another NonPakistan. And America will never allow Iran to go nuclear. We don’t think Iran wants to go nuclear anyway because they see what trap nukes have become for NonPakistan and because Iran has always prospered via trade and suffered through war. That is why the success of the Indo-Iranian venture in Chah Bahar can prove to be a kingmaker for Indian Ocean Trade and for peace in the region.